CHAMP Camp 2019 dates are set for June 16-20 at Bradford Woods in Martinsville, IN. We look forward to our 29th summer of CHAMP Camp where we have the opportunity to watch our campers gain independence and self-confidence, create unforgettable memories, and experience the wonder and the beauty of the outdoors. 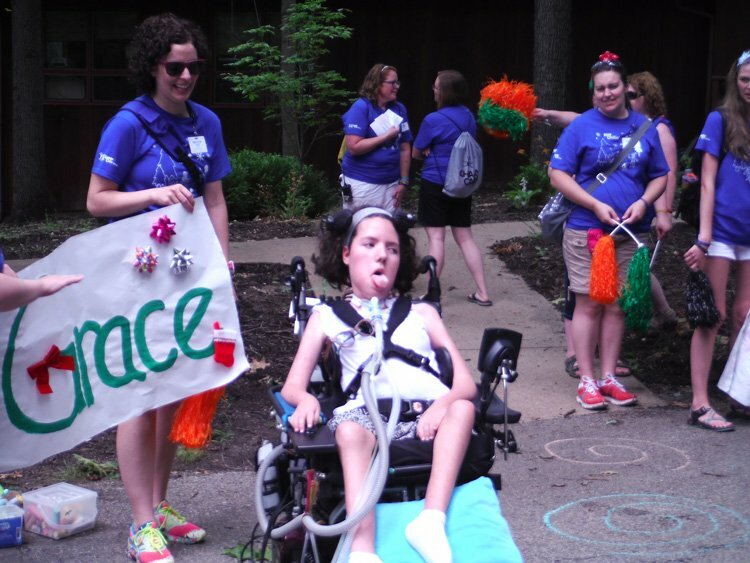 CHAMP Camp provides a week-long, summer camp experience for children and adolescents with tracheostomies and those who require technological respiratory assistance. Our campers enjoy and fully participate in outdoor summer camp activities including zip lining, swimming, canoeing and climbing that encourage independence, confidence, and self-esteem to create memories that last a lifetime. CHAMP Camp programs are rich in recreational activities. We feel a tremendous responsibility to create an atmosphere in which kids can thrive. In spite of a high ratio of counselors to campers, we don’t hover. Rather, we create an environment for kids to go to the limits which they are physically and medically able. It is an environment in which no child sits on the sidelines or has to worry about being different. As caring, skillful adults facilitate a variety of activities, we are also able to assess, monitor, prevent and respond to vulnerable medical conditions. Each year, our campers rotate among a variety of activities in their trail groups including creative arts, swimming, climbing, archery, canoeing, fishing, pontooning and more. Camper must have a signed medical statement from a primary care or specialty physician indicating that camper is medically stable. Camper must be at least six years of age and is eligible to attend until directly following the camper’s 18th birthday. Camper’s developmental level, regardless of chronological age, must meet cognitive and social milestones consistent with or greater than that of a six year old. Camper has a well-established communication system, verbal or augmentative, which allows for effective peer and counselor interaction. Camper has respiratory needs requiring one of the following: tracheostomy, ventilator, BiPAP, CPAP or oxygen dependency due to primary lung disease. Camper has stable oxygen requirements. Camper has respiratory treatments (aerosols, MDI, CPT) no more frequent than every eight hours. Campers requiring tube feedings should have a stable feeding regimen either with bolus feedings (no more than five times per day) or administered by a feeding pump. 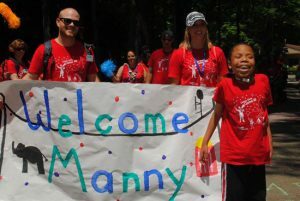 CHAMP Camp may perform an on-site assessment of any potential camper to ensure the child’s safety and appropriateness for participation at CHAMP Camp. Camp Directors reserve the right to exercise discretion regarding the appropriateness of any camper. As a potential camper, we understand that you might be wondering what your week at CHAMP Camp will look like. Here are some common questions that other kids have asked us prior to attending camp. We hope this gives you a better idea of who CHAMP Camp is and what you can look forward to as a camper. What does a day in the life of a camper look like? We have breakfast together every morning at 9:00 a.m. with all of our campers and counselors at The Baxter Dining Hall. Following breakfast, we head out with our trail groups to enjoy a programming activity together. Following that activity, you will go back to your cabin for a little rest and relaxation before lunch. Lunch is at 1:15 p.m. After lunch, you will then head out with your trail group to a second activity for the day. At the completion of this activity, you will head back to your cabin for some ‘cabin time’ with your fellow campers and counselors. Dinner is at 6:30 p.m. Immediately following dinner, our entire camp community participates in an evening activity including a Campfire with Songs and Skits, a Hay Ride, and S’mores, a Talent Show, a Dance and a Closing Campfire at the end of the week. Lights out is by 10:00 p.m. every night. What activities will I be participating in? You will rotate among a variety of actives in your trail group throughout the week including creative arts, swimming, climbing, archery, canoeing, fishing, tower, pontooning, paddle boating, zip lining and a scavenger hunt. Who will take care of me while I am at camp? CHAMP Camp counselors are health care professionals who at camp are friends and mentors. They listen, play, laugh, and know how to create and recognize magic moments. They are talented in many ways beyond their clinical skills… they can compose songs, initiate a hike through the woods, recognize the hoot of an owl, cheerlead at new achievements, and bait a fishing line. They live in the cabins with the campers to monitor and provide medical interventions round the clock. We staff 2.5 counselors for every camper guaranteeing a good mix of caring and sharing. We make a considerable effort not to “smother” or “hover” over our enthusiastic participants, and within safe bounds, CHAMP Campers have the freedom to explore the many facets of the outdoor environment. Seventy-five percent of our of our counselors are nurses, respiratory therapists, physical therapists, occupational therapists, speech pathologists, child life specialists, teachers, recreation professionals, and physicians. Other devoted volunteers include university students majoring in a health care discipline, as well as rehabilitation specialists who assist with equipment and technical, logistical support. What will I eat throughout the week at camp? There are three full meals served everyday at the Baxter Dining Hall with yummy and healthy options. If you are on a special diet, we collect this information from you prior to camp to ensure that your needs are met at each meal. The chef will accommodate any and all special requests that you have. In order to keep your energy level up during the day for all of our fun activities, snacks are readily available to you through the assistance of your counselors. What will my sleeping arrangements look like? As soon as you arrive at CHAMP Camp, you will get settled into your cabin. You will have your own bed and area for all of your things. Each cabin has a large room that sleeps 10 people which will be comprised of campers your own age and counselors. In addition, there are two small rooms adjacent to the large room that each sleeps four counselors. In each cabin, there is one private half bath, a large community bathroom. The Baxter Cabins are all fully accessible. How much does it cost to go to CHAMP Camp? Each family is asked to contribute $250 toward the cost of camp, but no one is turned away for inability to pay. For more photos, visit the picture gallery.